Pantrepant is our working farm nestled on the banks of Jamaica’s gentle Martha Brae River. This lush, tranquil property, owned by Chris Blackwell, dates to the 1700s when it was carved from rolling hills and forests into a thriving sugar plantation. Pantrepant is a destination unlike any other: It is a home, a working cattle farm and exquisite escape. The atmosphere is at once private, luxurious and laid back, and visitors can do as much or as little as they like. Ride into the fields on horseback, explore an ancient cave, swim amid old sugar cane ruins, observe cattle herding, hike or just relax in an oversized hammock. dramatic valleys and rich soil. High in the hills of Trelawny Parish off the island’s northwestern coast, Cockpit Country is a region both remote and tranquil — one that most visitors never see. It is known for its wealth of rivers, streams and caves, and remarkable diversity of plants and animals. Guests of GoldenEye and Strawberry Hill are invited to book an overnight stay at Pantrepant. Your home during your visit is our airy, two-bedroom, two-bath cottage, built by Chris and Mary for their friends. 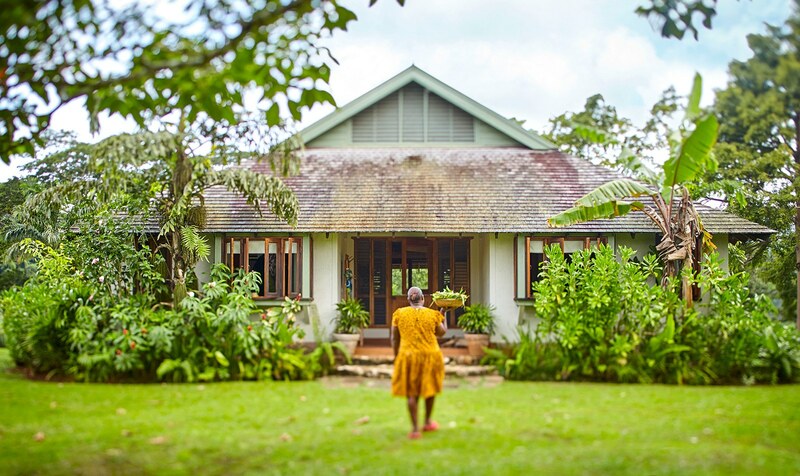 Hidden away amid lemongrass rushes and cotton trees, the cottage is private and secluded but only a minute-walk from the great house and Guango tree where lunch is served.